Environmental flows from Nepean Dam help maintain downstream river health. An environmental flow is water released from a dam or a weir to maintain downstream river health. WaterNSW releases environmental flows from eight dams and two weirs related to the water supply system. We publish daily, weekly and annual data on environmental flows from the following dams and water supply weirs: Avon, Cataract, Cordeaux, Nepean, Tallowa, Wingecarribe, Fitzroy Falls and Woronora dams, and Broughtons Pass and Pheasants Nest weirs. WaterNSW releases five megalitres of water each day from Warragamba Dam to dilute effluent discharge from the Wallacia sewage treatment plant into the Warragamba River. Another 17 megalitres of water is released each day in winter, increasing to 25 megalitres in summer, for Sydney Water to extract at its North Richmond Water Filtration Plant. These releases are specified in the Water Sharing Plan for the Greater Metropolitan Region Unregulated River Water Sources 2011. In the 2010 Metropolitan Water Plan, investigations into a new environmental flow release regime from Warragamba Dam were announced. The Department of Finance and Services is currently coordinating these investigations with substantial contributions from WaterNSW. A decision on environmental flows from Warragamba Dam is to be included in the next Metropolitan Water Plan. WaterNSW releases water from Tallowa Dam and Wingecarribee and Fitzroy Falls reservoirs to help improve the environmental health of the rivers downstream and sustain riparian rights (rights of riverbank landholders to use the river water). At Wingecarribee Reservoir, at least three million litres of water is released downstream every day for environmental purposes and one million litres for riparian (riverbank) users. At Tallowa Dam, daily variable flows for environmental purposes began on 15 July 2009. Environmental flows and improved movement of fish up and down the river were made possible by the installation of a new offtake at Tallowa Dam, a new spillway gate at the top of the dam which ensures the environmental flows are at a similar temperature to the downstream river, and a mechanical fish lift to allow native fish to move upstream and downstream. At times of low flows, all inflows to Tallowa Dam up to 371 million litres a day (depending on the season) are released to the downstream river. At times of higher flow, an additional 20 percent of inflows to Tallowa Dam are released to the downstream river. Releases to the downstream river from Tallowa (up to 90 million litres per day) are made for the Shoalhaven region's water supply. At Fitzroy Falls Reservoir, environmental release levels are linked to inflow rates measured at Wildes Meadow Creek. These releases flow down Fitzroy Falls. WaterNSW introduced daily variable flows from the Upper Nepean dams and water supply weirs for environmental purposes from 1 July 2010. Improvements to weirs along the Hawkesbury-Nepean River help the new flows make it downstream, with new fishways to allow fish to move more freely up and down the river to breed. At times of low flow, all inflows to the Upper Nepean dams and water supply weirs are released to the downstream river. Daily variable inflows of up to 20.1 million litres are released from Nepean Dam, up to 6.8 million litres from Avon Dam, up to 4.5 million litres from Cordeaux Dam and up to 14.5 million litres from Cataract Dam. These releases are passed through Pheasants Nest and Broughtons Pass weirs to the downstream river. Inflows from the catchments between the dams and weirs are also released from the weirs, including up to 4.4 million litres from Pheasants Nest Weir and up to 4.5 million litres from Broughtons Pass Weir. At times of higher flow, an additional 20 percent of inflows to each dam and water supply weir are released to the downstream rivers. 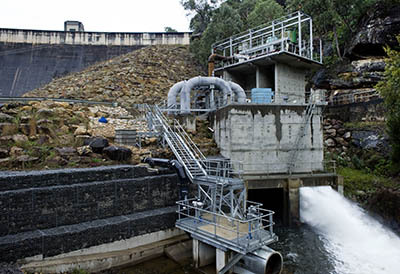 WaterNSW introduced daily variable flows from Woronora Dam for environmental purposes from 15 July 2009. At times of low flows, all inflows up to 4.1 million litres a day are released to the downstream river. At times of higher flow, an additional 20 percent of inflows to Woronora Dam are released to the downstream river. The Blue Mountains system is comprised of five small reservoirs located high in the catchment. Apart from overflows during periods of high rainfall, there are no current environmental releases from these dams.